Facebook has restricted its user to chat in black text due concerns of server overloading and speed. But now you are no longer bound to chat in black text. There are some special codes for you that empower you to send colourful text in chat. This trick is solely based on the fact that when profile ID’s are inserted in between square brackets, it automatically transforms into the profile picture. These ID’s are specially created for this purpose. 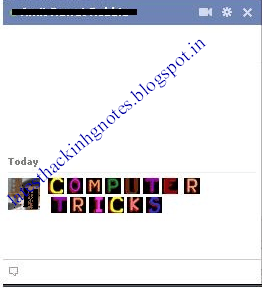 You can also send messages in colourful text but these codes will not work in Status update. This will also not work if the other person is using chat from his mobile. To create a word of colourful text copy the codes of alphabets and make sure to insert single space between the each alphabetic code. Here is the code for COMPUTER TRICKS. Now have a colorful chat and don’t forget to like this post! !